This is a microscopic section from the edge of one of a group of small round clear vesicles on the skin, just above the lip. 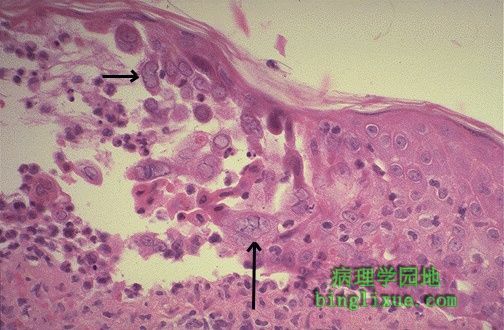 Notice the mauve to pink homogenous intranuclear inclusions in the epithelial cells of the epidermis. This is typical for Herpes simplex virus (HSV) infection. The most common sites for Herpes simplex virus infections (either primary or reactivation) are skin and mucus membranes. HSV type I is seen most often in oral cavity, while HSV type II is more commonly a sexually transmitted disease.